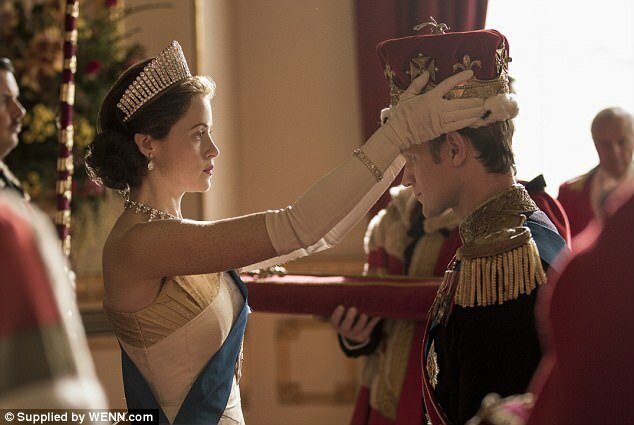 Home Amazing Netflix series The Crown will dedicate entire episode to Royal Family’s links to Hitler's Third Reich including Edward VIII's infatuation with the Nazi party . Netflix series The Crown will dedicate entire episode to Royal Family’s links to Hitler's Third Reich including Edward VIII's infatuation with the Nazi party . The Royal Family's links with the Nazis will be covered in an upcoming series of The Crown, it has been revealed. 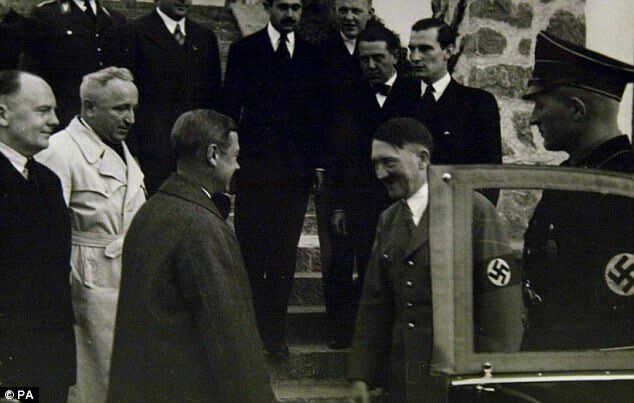 Edward VIII admired Adolph Hitler, posing for photographs with him during an unofficial visit to Germany in the 1930s, and once claimed the establishment of the Third Reich was 'the only thing to do'. The monarch, who abdicated in 1936 to become Duke of Windsor, even visited a concentration camp whose guard towers were apparently explained away as meat stores. Hitler himself reportedly claimed 'friendly relations with England could have been achieved' if Edward had not abdicated to marry American divorcee Wallis Simpson. Robert Lacey, The Crown's historian, told an event attended by The Telegraph: 'Somebody said to me the other day, the problem with your Edward VIII is that you don't talk about his Nazi side so I don't watch it any more. Thomas Mace-Archer-Mills, Founder and Chairman of the British Monarchist Society and Foundation, told MailOnline: 'Netflix are doing fantastic research, and we can't go ahead and omit the parts of history that are unsavoury. 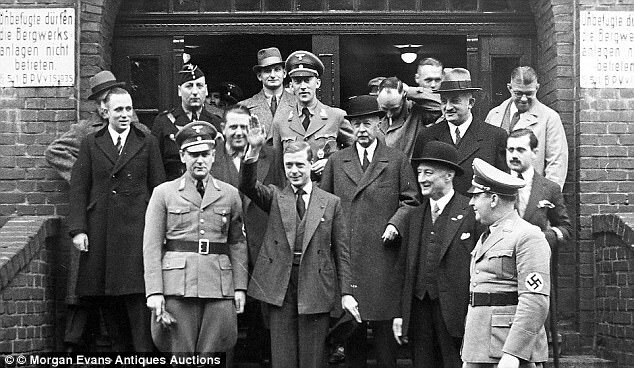 It was well documented that Edward VIII went to Germany and met with Hitler, so I don't think The Crown has been unfair. A film uncovered in 2015 showed Edward teaching the Queen and Queen Mother how to do a Nazi salute in 1933, six years before the outbreak of World War Two. The former Duke of Windsor's memory has long been tainted by his connection to the Third Reich. 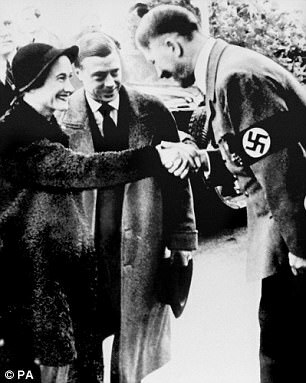 His visit to the Third Reich with Wallis Simpson took place in 1937, a year after he had abdicated as king. The duke's guide on the visit where he saluted the Nazi officials was Robert Ley, the man Hitler had put in charge of the German labour front. Violently anti-semitic, Ley was implicated in the mistreatment of slave labourers and at the end of the war was charged with war crimes and crimes against humanity. He hanged himself in his cell before he went on trial. Two separate sequences capture Edward giving the Nazi salute – one on the steps to a building, presumably the mine's main office, and another as he leaves his car and walks past onlookers. Given tensions between the two countries at the time, British diplomats strongly advised Edward against making the 12-day visit to Germany in 1937. When he insisted on going they refused to allow anyone more senior than the third secretary at the British embassy to accompany him. As well as touring a mine and meeting Hitler at his mountain retreat, Edward visited a concentration camp whose guard towers were apparently explained away as meat stores. The duke met and dined with dozens of senior Nazis including Hitler's deputy Rudolf Hess and his foreign minister Joachim von Ribbentrop. He also met Hitler's propaganda chief Joseph Goebbels, who was so convinced of his fascist sympathies he described him as a 'tender seedling of reason'. It is thought that the couple – who had been given their titles earlier that year – would have been installed as puppet monarchs had Germany taken over Britain. Edward faced numerous accusations of being a Nazi sympathiser and is known to have performed the salute at other times. He was once said to have given a Nazi salute to Hitler - which he later claimed was a 'soldier's salute' - and claimed the Fuhrer was 'not a bad chap'. The second series of The Crown will be screened on Netflix on Friday and is set in the late Fifties and early Sixties.